The Mothman Antique Mall will officially open for business this Saturday, March 30 at 214 4th Street in Point Pleasant. Owner Charlie Perry is well known in the local antique community, helping to organize the annual bottle show at the West Virginia State Farm Museum. The Mothman Antique Mall will be full of colletible items, offering one-of-a-kind purchasing opportunities for customers and selling opportunities for vendors. Open 9 a.m. - 5 p.m., seven days a week, call 304- 675-5738. Sidewalk sales offered as weather permits. The mall is in the same building as Studio 45. Pictured at the ribbon cutting are Perry, at center, along with Mayor Brian Billings and City Clerk Amber Tatterson. The Mothman Antique Mall will officially open for business this Saturday, March 30 at 214 4th Street in Point Pleasant. 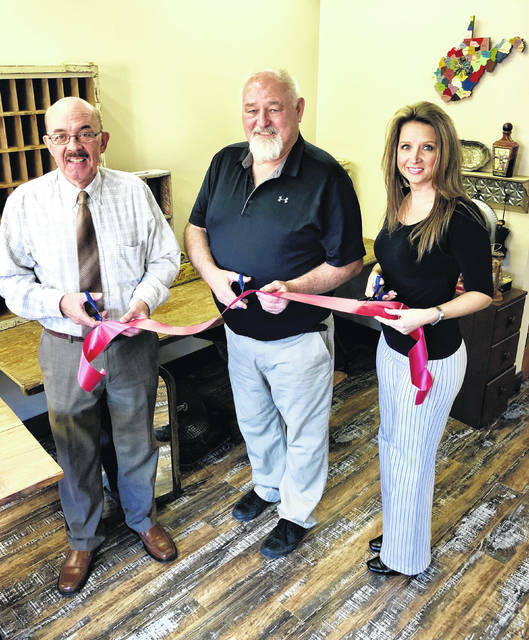 Owner Charlie Perry is well known in the local antique community, helping to organize the annual bottle show at the West Virginia State Farm Museum. The Mothman Antique Mall will be full of colletible items, offering one-of-a-kind purchasing opportunities for customers and selling opportunities for vendors. Open 9 a.m. – 5 p.m., seven days a week, call 304- 675-5738. Sidewalk sales offered as weather permits. The mall is in the same building as Studio 45. Pictured at the ribbon cutting are Perry, at center, along with Mayor Brian Billings and City Clerk Amber Tatterson.